Most people today remember Twisted Sister as the spearhead of the Hair Metal movement with their poppy bubble gum anthems all over rock radio. In truth the band dates back to the 70s and began as a hard rock glam act before vocalist Dee Snider arrived and introduced the music of Judas Priest, AC/DC, Sabbath, and the New Wave of British Heavy Metal. This debut is far removed from what will follow two albums later with 1983’s breakthrough album, “Stay Hungry”, containing a sound that is raw and mean, stripped down and primal. Each track is a classic of it’s kind: “What you Don’t Know, Sure Can Hurt You” is an awesome Alice Cooper inspired anthem (echoes of his “Hello Hooray!”) that welcomes us into their metal world. Rebellious and insidious, this is a perfect way to set up the heavy album. “Run For Your Life” features a great melodic spoken intro by Snider that recalls Zeppelin before the song gets heavy and speeds up to the level of Priest brutality. “Sin After Sin” is clearly titled as a tribute to the Priest masterpiece of 1977 of the same name. And the song very much recalls the same sound from those 70s records, clearly showing the band was capable of such. “Shoot Em Down” rocks like heavy Kiss but features a more UFO inspired chorus. 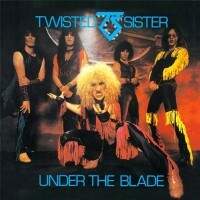 “Under The Blade” is Twisted Sister’s best song and my personal favorite, this is the one all Manowar loving metalheads reach for first. Guitarist Jay Jay French’s riff is one of his best and the lyrics are among the best the band ever wrote. “Tear It Loose” is a speed metaller that is inspired by Motorhead. Motorhead’s ace guitarist, Fast Eddie Clark, even contributed a solo to the classic. Another album standout.